“My dad Fritz Tschumi founded the company Britalmoto in 1997, whilst he worked in another job fulltime. He did it in his free time; he built classic racers and is a specialist in tuning. 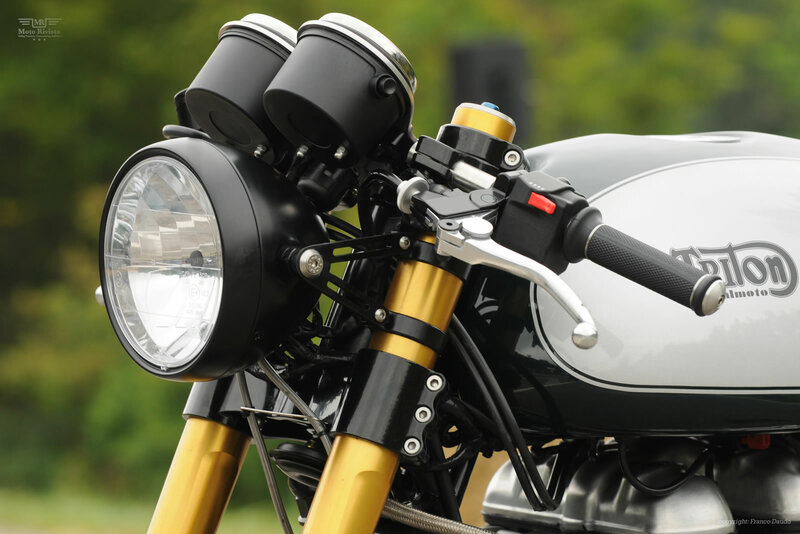 I started bike building/customizing around 2007, I first built the Thruxton Ton Up Boy, my second one was the Thruxton II and the third the Britalmoto Harrier. At the beginning I worked 70% in another company, the rest of my time in our workshop. In 2011 I quit my other job and now I work 100% in our company. Now Britalmoto GmbH is still my dad and I, he’s retired now and helps whenever he can. So you could say we are a 1-½ man company. I lead the company; make the offers, contracts, orders, designs, the builds and everything. My dad is the tuner and engineer, but the Triton was almost built by him, I did the design work like the new seat and the colour scheme etc. Our philosophy is simple: always make a bike better than it was before! The bike has to look better, be faster and have better suspension. Never go in the other direction. So I think we would never build a bike with a rigid frame, but you never know! 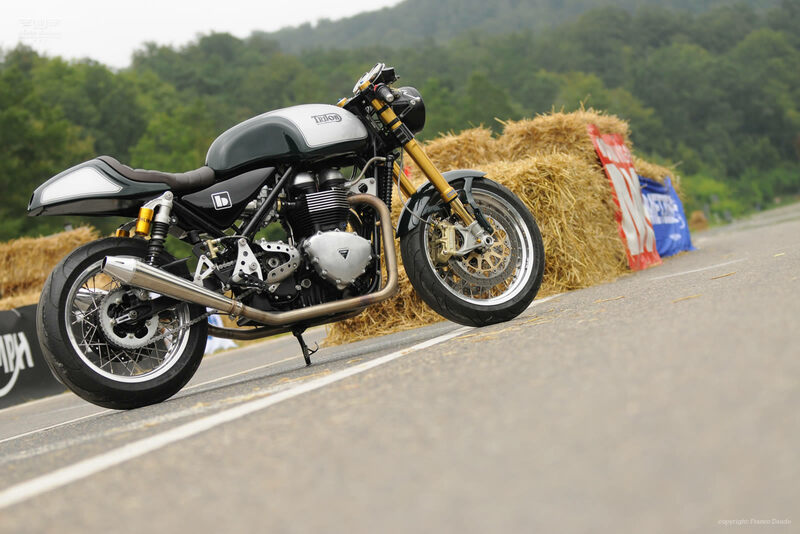 For example: I changed the front-end of my Thruxton from a stock into a Ducati 996, did the engine, body mods etc. Before I ride it on the street, I tested it 300km on the racetrack in Oschersleben/Germany to be sure that everything is ok! It’s because we came from the racetrack. We are hobby racers; I ride a Ducati 916, my dad a Triumph Trident T150 with an original Rob North Frame and a Ducati 860 “Königswelle”. 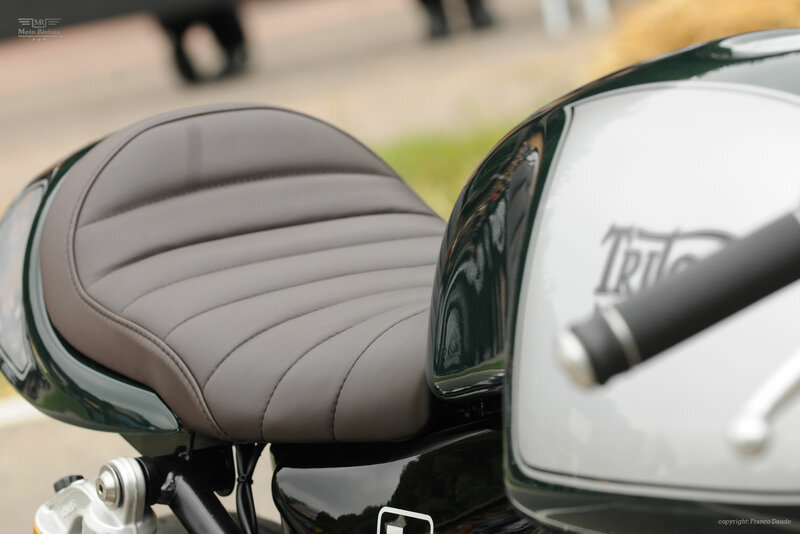 The name “Triton” is a combination of “Triumph” and “Norton“. 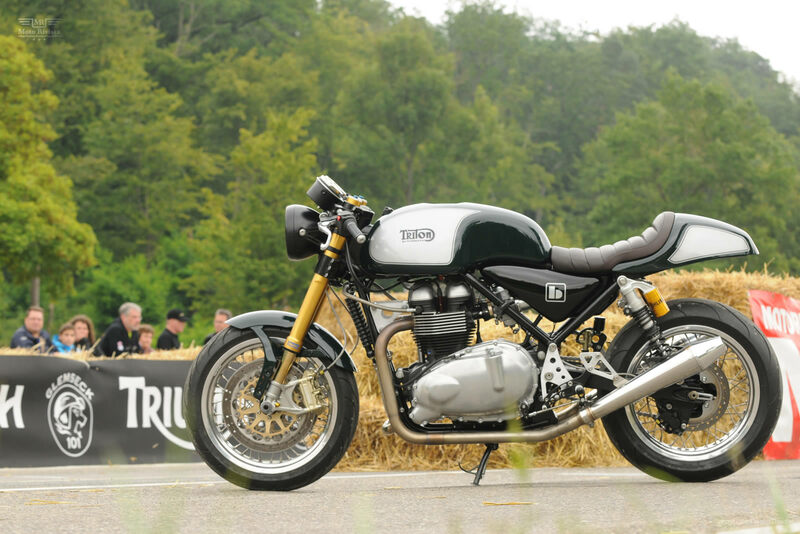 One says, that a Triton combines the best of a Triumph and a Norton. It is a fact that Norton built with its Featherbed frame, the best frame commercially available in the 60’s. The frame was developed originally for the legendary Norton Manx race bikes, but found its way into the mass production bikes in the form of the “Slimline” and “Wideline” versions. Triumph, on the other hand, built the excellent Twin Cylinder engines (T100; T120; T140) which all were based on the design of the “Speed Twin” introduced in 1937. It was therefore not more than logical, that ingenious brains came up with the idea to combine the two outstanding components. One of the best-known builder of Tritons certainly was Dave Degens. He was not only commercially successful, but also showed on the racetrack how superior a Triton was by winning the prestigious 1965 Barcelona 24h race at Montjuic Park. The Triton then became the “poor mans” race bike and resulted as synonym for the “Cafe Racer” cult in the 60’s. Each and every Triton is unique and until today a very sought-after motorcycle. It is therefore not more than logical again, after the revival of Triumph and Norton, to combine these two products. On one side, Triumph Hinkley is building since 2001 successfully air cooled twin cylinder motorcycles that have, with regard to quality, a superior reputation. Especially the engines are very reliable and have a large tuning potential. With regard to the rolling chassis and design people have different opinions. Britalmoto therefore decided to combine the best of the two worlds again. One of our customers had bought a new Norton Commando 961 Cafe Racer. As many others he was unhappy with the engine and transmission. Because he knew the potential of the new Triumph Twin Engines he asked us to transform his Norton into a “New Triton”. What sounds easy soon developed into a 450h project! 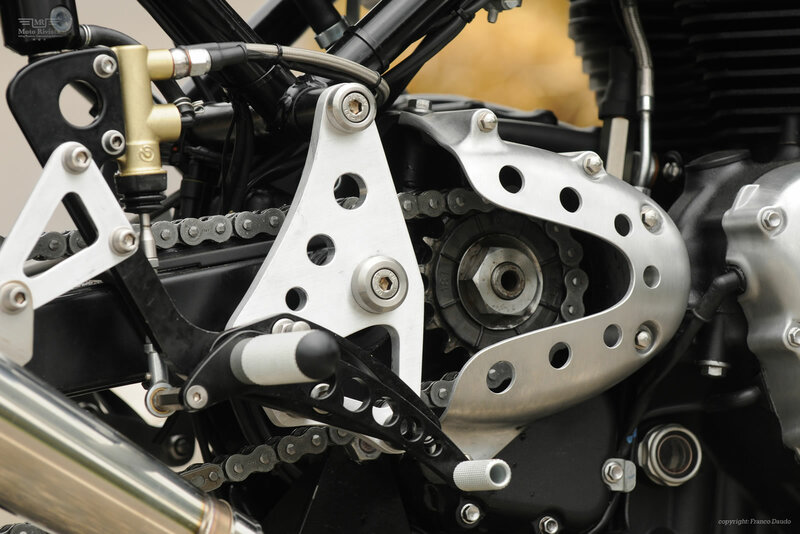 Extensive modification on the Norton frame was necessary to fit the Triumph engine. The entire engine mounting points and swing arm supports had to be re-engineered and fabricated in-house. 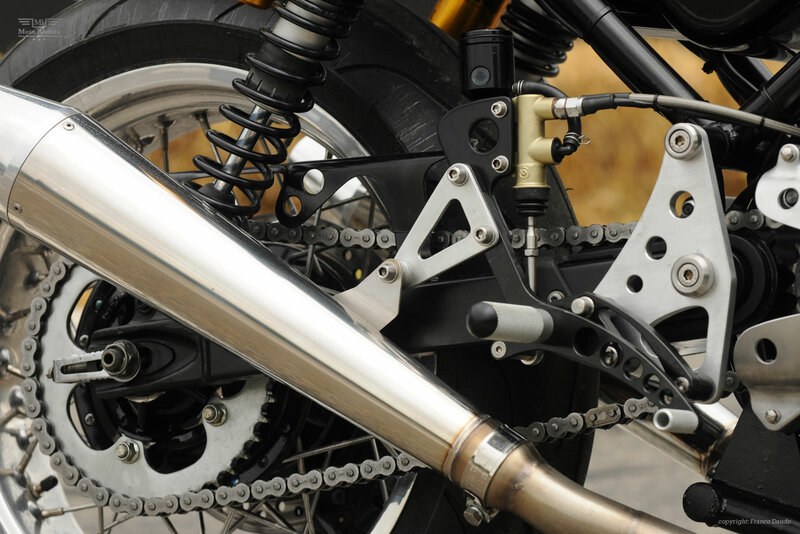 The swing arm pivot point has been located such that it is almost identical to the original and the excellent road performance of the Norton chassis is maintained. Further, our customer wasn’t satisfied with the performance of the original Triumph engine for his dream bike. So it was decided to install the 1087ccm, 96HP, 104Nm (measured at the rear wheel) version. To match the increased power of the engine, new enlarged primary pipes made from stainless steel and QD silencers were installed. Another issue was the original design of the rear seat assembly. It was considered as being too big. We therefore designed and manufactured a seat, which suited our taste. The end result is triumphal fusion of two legendary motorcycles, a reward for the rider and a pleasure for its observers.